On this date in 1525, radical religious reformer and Peasants’ War leader Thomas Müntzer lost his head in the town of Mühlhausen. Müntzer, a university-educated theologian, caught the whiff of Lutheranism in the Zeitgeist; following Luther’s call to study the Biblical text directly without the intervention of the doctors of Rome, Müntzer swiftly discerned a heavenly admonition to set to rights the many wrongs of an unjust world. Luther had not had in mind dispossessing the haves, particularly not when imperial electors defended him from the Pope’s inquisitors. This revolutionary ardour did not last long. The lightning thrust by Luther caused a conflagration. A movement started among the entire German people. In his appeals against the clergy, in his preaching of Christian freedom, peasants and plebeians perceived the signal for insurrection. Likewise, the moderate middle-class and a large section of the lower nobility joined him, and even princes were drawn into the torrent. While the former believed the day had come in which to wreak vengeance upon all their oppressors, the latter only wished to break the power of the clergy, the dependence upon Rome, the Catholic hierarchy, and to enrich themselves through the confiscation of church property. The parties became separated from each other, and each found a different spokesman. Luther had to choose between the two. Luther, the protégé of the Elector of Saxony, the respected professor of Wittenberg who had become powerful and famous overnight, the great man who was surrounded by a coterie of servile creatures and flatterers, did not hesitate a moment. He dropped the popular elements of the movement, and joined the train of the middle-class, the nobility and the princes. Appeals to war of extermination against Rome were heard no more. Luther was now preaching peaceful progress and passive resistance. Muntzer became adopted into the Marxist pantheon sufficiently to grace East Germany’s five-mark bill. That’s Engels in The Peasant War in Germany, revisiting the theological conflicts at the birth of the Protestant Reformation from the perspective of 19th century Marxism. Projecting backwards, Engels saw in Müntzer a distant forerunner of their own day’s class conflicts — the man whose language was Biblical and apocalyptic but whose subject matter was the peasantry’s demand for material justice. 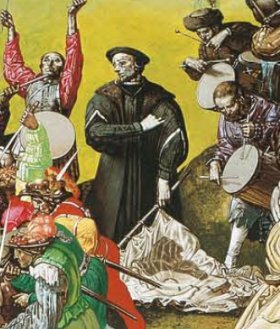 In this detail view of East German artist Werner Tübke’s weird panorama of the Battle of Frankenhausen, a crestfallen Müntzer realizes divine aid is not forthcoming. So it was with Müntzer, who was captured in the decisive Battle of Frankenhausen, tortured into recanting his heretical doctrines,** and beheaded. Whether one thinks of politics leading Müntzer’s theology or theology leading his politics† or some sort of dialectic between them, we see Müntzer latterly through a glass darkly — the wasted root of a lost Reformation. * From a 1524 pamphlet vituperatively entitled “Highly provoked defense and answer to the spiritless, soft-living flesh at Wittenberg, who has most lamentably befouled pitiable Christianity in a perverted way by his theft of holy Scripture,” reprinted in Revelation and Revolution. ** Müntzer’s theology included rejection of infant baptism, which ranks him as an early anabaptist. Hemos creado una web acerca de Múntzer. Podeís colaborar con artículos opiniones, etc. Muchas gracias. POR QUE thomas muntzer ele foi uma das grande reformadores da ingreja catorica levantada pela primeira vez por Lutero???? ?